Although I routinely go out of my way to avoid contemporary fiction (especially the so called issue books), I can, off the top of my head, name at least five that made me want to curl up in a fetal position and cry my little heart out. Which, make no mistake, is a very good thing. They are the books I don’t hesitate to recommend to teens and adults alike, books I admire even though they make me extremely uncomfortable. Because, in the rare event when I do decide to pick up an issue book, I want it to shake me to the core, make me thing about things I’d rather ignore and force me to acknowledge the potential ugliness of the world. Faking Normal isn’t one of those books. Admittedly, I did finish it more or less in one sitting, which would usually mean that I enjoyed it greatly. But you see, I shouldn’t have been able to breeze through a book about two severely damaged teens. I should have felt the need to stop and distance myself at some point, as I so often do. A book like Faking Normal should have been emotionally overwhelming, but instead, I more or less flatlined. Even after many hours spent thinking about it, I cannot quite pinpoint what it was about Faking Normal that rubbed me the wrong way. Techinically, Stevens did everything right. Her writing is almost flawless and her pacing superb. I adored Bodee, the wonderful Kool-Aid Kid and there were times when I did feel Alexi’s pain, although not as often as I’d have liked. I think it was mostly Alexi’s attacker that bothered me. His reactions and overall characterization simply didn’t ring true. The mystery surrounding Captain Lyric added a much needed touch of normalcy into this heavily burdened story. I believe it to be a calculated move on Stevens’ part, designed to constantly remind the reader that Alexi is indeed a very young girl, and in that, it was successful. But the identity of Captain Lyric wasn’t a mystery for the reader at all. Looking at him from this side, there was really only one possible solution. The understated beauty of Courtney’s Stevens’ prose isn’t likely to disappear with a topic change, which is why I won’t hesitate to read and even pre-order her sophomore novel. She undoubtedly has enormous potential. I wonder where she’ll take us next. I think you nailed when you said you shouldn't be able to breeze through this kind of book (in reference to what you couldn't pinpoint, I mean). And sometimes it's just really hard to relate to characters in books like this (for me anyway). I can feel sympathy, sure, but it's kind of from a distance . . . Anyway, I'm sorry this one didn't nail it for you, but I'm glad you can appreciate the author's obvious talent. I'll keep an eye on her future projects too. Aww, it's a shame you weren't able to become as deeply entrenched within this novel as you hoped. 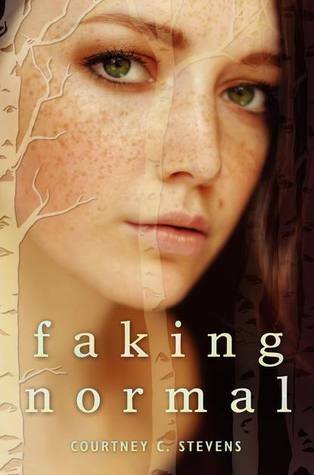 Faking Normal didn't make me curl up into a fetal position either, but I definitely had a strong emotional reaction to it, one which you will hopefully feel with Stevens next novel. Like you said, I definitely feel as if she's a promising author to look out for. Wonderful review, Maja! Thank you for the very honest review, Maja! I still have doubts whether I'll read this one or not, it does sound like the kind of contemporary I'd read... but I don't know if it's one I really have to read. Yeah, I'm with you on contemps, YA in particular. I do love having books like this in my roll to rec to teens and teachers but it takes a lot for me to actually pick one up and read it. Hmmm. Most of the reviews I've seen for this one have been really positive, so it's interesting to read a differing opinion Maja! Sometimes I have the same problem - I can't really put into words exactly what bothered me about a certain story, I just know some things felt off. It's too bad that happened with this book, but I'm glad you see so much potential in the author! I'm sorry this wasn't as satisfying, Maja. But I do get your point of how a book with this much emotional issues should've left you a greater impact than this book has. I don't know why I always think its Blake Lively on the cover but the model sure does look almost like her! Anyways, I'm not sure about picking this one up particularly because of the questionable realness of it. Oh no, how disappointing. I am like you and want books like these to stop and really make me think and to even shake me up a little. I am sorry this one wasn't better but glad that you were still able to get through it. I usually go out of my way to avoid issue books as well but that's because a lot of the times the issues aren't dealt with the delicacy they deserve. Nope not going there. I am done with these issue books. I want and funny and that is what I am reading these days! it looks complex, I don't like when I have to think about the book that much to understand what was a problem for me. I'm sorry it was like that. Oh maybe I CAN handle this book. I HATE to cry.... and since it didn't make you go all fetal position... I may be able to deal. :) I like that you didn't love it, but still enjoyed it to look forward to the sequel. Okay, now I'm curious. I'm sorry that this didn't leave the impression with you that you were hoping Maja, I know what you mean by gritty novels leaving you thinking about passages in between reading, instead of being able to read the entire book in one go. I too was able to guess the identity of Captain Lyric, but was completely shocked by the identity of the other person. Despite your overall rating of this book, I'm glad to see you're still eager to read more by Stevens! I seen a lot of five star reviews for this one, so honestly to me it was very refreshing. I guess I see where you are coming from on this one. But it does sound like the author has a lot of potential. I don't do sad well, occasionally I get in the mood for a good cleansing and grab books that rip me apart and leave me raw. I am sorry this didn't deliver the powerful feelings you needed. It sounds like it just skimmed the surface leaving you no more than an observer. I haven't seen any reviews for this one yet but I have it in my TBR pile. It's good to know that you liked Stevens' writing and pacing even though you thought something about this one was off. I'm planning on reading this one soon and hope I like it at least as much you, Maja. It still sounds quite interesting. I haven't heard of this book before now. I have to admit your review makes it sound even more intriguing...hehehe! I've almost bought this one a couple times. I've been very curious. Books like these really need to be spread out but I do enjoy feeling some strong emotions once in awhile. The fact that it didn't punch as hard as you thought, and wanted, might not be a negative for me. I enjoy a good emotional read, but I often put them off. This might make it easier to pick up. I'm still thinking I want to try this one. Who knows, maybe it'll affect me more strongly. I think issue books affect people differently depending on their own life experiences, mood, etc. Well, any book does actually. So maybe I'll grab this from the library instead of buying it.